At the top of my wedding to do list is Bridesmaid proposals! 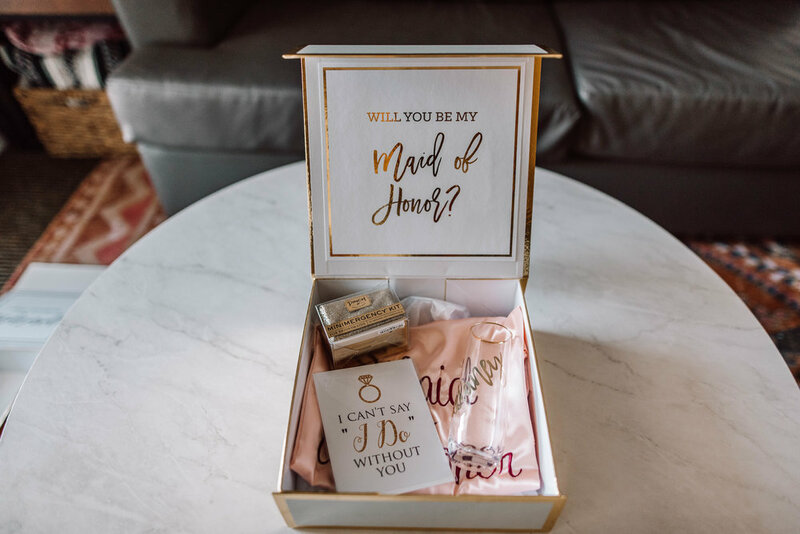 I have always wanted to put together a super cute box for my future bridesmaids as a cute way to ask them when the time came! Well, the time has finally come my friends and luckily David’s Bridal has literally EVERYTHING I imagined and more to put these cute boxes together! Today I will be sharing with you what I picked out from David’s Bridal. A ton of their stuff is customizable which made a special touch and you can order all of these things online! They also have so many other options that were just as cute so be sure to check out all of their other bridesmaid goodies online too! Like I said, I wanted to put together an actual box for my girls and I wanted to fill them with some fun goodies! These boxes that I found were the PERFECT thing! I got each box customized to have my bridesmaid’s names on them in gold foil! Inside you can also get a little message that you can attach to the lid. I chose “Will you be my Bridesmaid?” for my boxes and one that said “Will you be my Maid of Honor?” for my MOH! 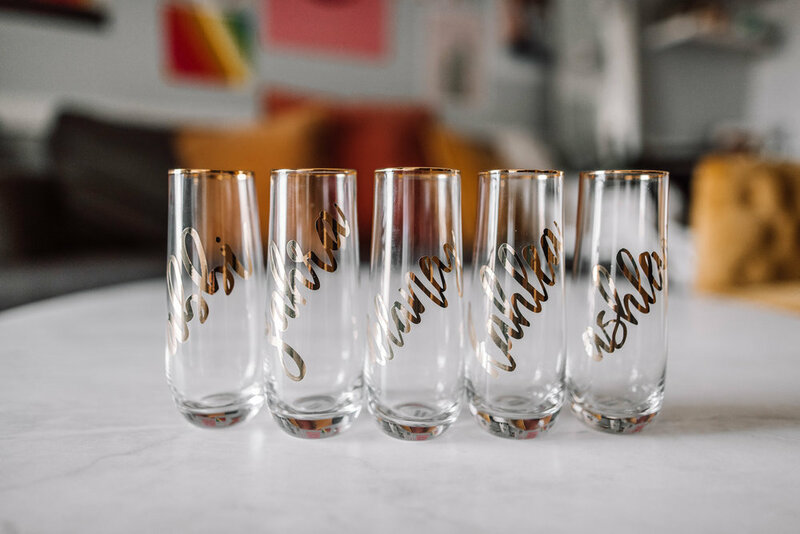 For my first gift inside the box, I chose these beautiful customized gold stemless glasses and again, got everyone’s names put on them! I thought this was a super neat touch and made the box feel so special! I thought this was the most adorable thing! This kit includes a few things a bridesmaid may need to use last minute on the big day! I love how it went right along with the theme of everything! This is perfect if you are looking for just something small to gift your girls or it is the perfect filler item for a larger box of goodies! Next I chose this card that says “I can’t say I do without you.” I thought this was perfect and super fun! The card is blank on the inside so it was perfect for me to write each girl a personalized message! This was definitely my favorite pick! I got these beautiful peach robes for all my girls to wear day of the wedding while we all get ready! On the David’s Bridal site you can get these in so many different colors! You can even choose the font and font color on the robes! I chose to have mine say “Bridesmaid” and “Maid of Honor” but you could have them say whatever you want! I added a bit of white tissue paper to the boxes and added all the gifts inside! Here are some photos of the finished products before sending them off! I absolutely loved every minute of putting these together from picking out and customizing the items to assembling the boxes! David’s Bridal makes it so easy and it really is a one stop shop! No need to sift through so many different sites trying to get stuff that will look cute together! Everything you need can all be found in one place on the David’s Bridal site! I hope you guys enjoyed seeing all the details about my Bridesmaid Proposal Boxes! I am so happy I could share this with you all! Stay tuned for more wedding related blog posts soon!